We all need a good High Pressure Tyre Pump, especially if you intend to go off road in your 4x4 or SUV. My personal preference is to use 12 volt battery power, as I'm getting a bit long in the tooth for manually pumping up BIG 4x4 Tyre's. P.S. I have a High Pressure Hand Pump (and YES I do use it now and then to keep fit) plus an Old Foot Pump that's long past its use-by date. The photo below is of my own personal 12 volt high pressure pump I bought online. I also did a video showing it in action pumping up a 4x4 Tyre for those interested. A 12 Volt High Pressure Tyre Pump is shown in the photo above. 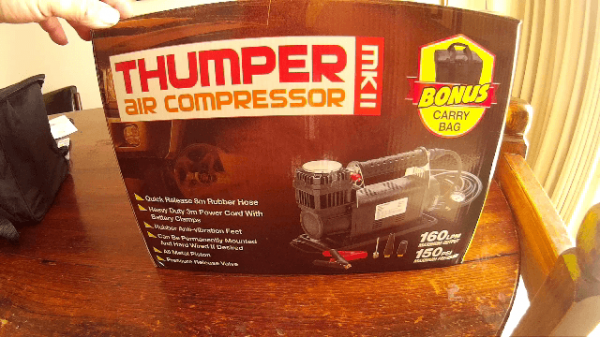 The Demo Video Below, is my 12v Thumper Air Compressor in action. I should have had the car motor running for this video, when I was using the 12v pump, (It can drain your battery, if you pump up several Tyre's in one session) for me, having the car motor running wasn't necessary, as I had a second vehicle on hand, if I needed a jump start. The 12v powered High Pressure Pumps, make life so much easier, and really aren't that expensive to buy. I really recommend them over manual ones, any day of the week. If you intend to do beach driving, you will need to regulate your Tyre pressures, by lowering them for the sand condition, and then re-inflating them for dirt, and normal on road use. This is a lot of hard work, if you have a hand, or foot operated pump only.